Do you have any pictures of your power supply wiring? I am just curious how mine compares to yours. 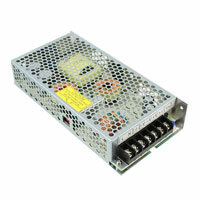 So how are you using a 36V, 4.3A power supply with your flipper coils? If you are using FL-11630 coils on your flippers, the hit coil resistance is around 4.6ohms. Just using v=ir, that means the coil is going to want to pull 7.8~A. Also, I’ve seen many pinball DIYers using a 70v psu to drive their coils, yet still don’t meet the amperage levels. I really haven’t heard anyone address this, thoughts? When the Flipper is activated, there is a voltage being generated across the coil that is resisting the change in current, so the current is actually ramping up, not a step change. The action is fast enough that by the time the Flipper reaches full stroke, the current has not exceeded the limit of the power supply. At this point, the EOS switch kicks in, and the “Hold” coil (high resistance, low current) is placed in series with the power coil. I tend to use old-school Flipper mechs (which you can buy brand new for about $50), and they typically run at +43VDC. I think that using a 70VDC supply is not a good idea… If you’re not aware of what type of coil you’ve got, you could easily over-current. And the 70VDC flipper systems tend to not have hold coils, meaning you have to PWM the signal once you hit EOS, or else you really will have a V=IR current around 15A. The other up-side of using a 4A max power supply is that you’re limited to 4A… Way more than you realistically need. Great post appreciate the info. I am running into difficulty with the power supply you suggested working with fl-11630 solenoid. From the Zachary reply above it seems you didn’t use this coil at all for this reason(but i couldn’t quite confirm 100% from your reply). I decided to configure the whole pinball flippers with the old school method without the pinball drivers. With the current setup it shuts off the limited power supply before it hits the hold coil the only thing i can think of is the 9.8 amps required is causing my dilemma since the power supply is limited at 4.3 amps. I’m curious how you bypassed this. I probably will figure it out but if i don’t i was hoping for some advice with your experience. If i just need to up power supply or change the solenoid coil for 43 volts then so be it but i’m hoping there is a another way. Since that would require waiting for those things. Can you give me a few more details about your current setup? Are you using 43 volts right now or the 70 volt that’s mentioned in the previous post? If anything, I’d probably lower the voltage. I never need anything above 38 V for my systems. Can you post a pic of your wiring for the hold circuit? This is usually not very straight forward, and can be easy to have a mistake in the wiring logic. Also, if you are tripping your power supply before hitting the EOS switch, might be good to adjust the switch to activate earlier in the stoke. What is your control system? A P-ROC or Arduino? I adjusted the Lamda LS150-36 to about 44 volts by maxing it out. Just using a simple circuit: power supply(44v as mentioned before) connected straight to the solenoid [no relay at all ] with a push button and leaf switch to close the circuit. If you look at that coil FL-11630 there is numbers on it 3 2 1. 3 is the positive side for the power and hold coil. 2 is the negative or ground for power coil. 1 is the negative for the hold coil. I hooked up 3 straight to power supply. 2 is hooked to one side of the push button leaf switch and to one side of the eof switch. 1 is hooked up to the other side of the eof switch. the last connection is the negative from power supply to the other side of the push button leaf switch. I tested the hold coil by not connecting the power coil on the solenoid. By connecting the 2 connections involved and pushing the shaft in so it can hold it, the power supply never kicked had a strong hold. So its confirmed I am kicking the power supply with the power coil its happening before the eof switch which is weird because its causing a flutter effect. If i hold the button down or close the circuit the power stroke hits then it goes to the hold stroke but releases since the power supply shuts down and restarts the process = flutter effect. If you still need a video or picture i will send you one. I think I see your problem… The push-button switch should be putting GND on Pin 1 in your setup, not pin 2. Also make sure your EOS switch is *normally closed*, sounds like you have it across the hold coil from 2 to 1, which would be correct. Also, I would wind your voltage down to about 36v~38v. By maxing out the voltage, you’re causing your load to draw more current while simultaneously reducing the amount of current your supply can source. Okay, so I tried both suggestions. Note: My coil for some reason is different then a ballys coil or the one I’ve seen 1000 times in the pics you have and others. The secondary coil is on pin 1 and first coil is on pin 2 that is confirmed. Now after posting my 2nd reply and pondering about it over last night also after you suggested it I lowered the voltage on the power supply I lowered as low as it could go which was 28 volts. I am sad to say it didn’t cut it. It did not work. Still killed power supply after the stroke and caused it to reset like before. So I’ve come to conclusion either I get a weaker coil or up the power supply. Even though I’ll still probably try the small wire and maybe resistor(which pretty sure that wont do anything). Thanks for the assistance the responses etc.. and I do love this blog thank you taking the time to post it. I’ll keep you posted on my adventures of building my custom pinball machines. At 28 volts the current is at 5.3 amps so still over the threshold of the power supply limit of 4.3 amps. So if i could get it down to 22 volts maybe that suggestion would work. How are you measuring your current? I would still recommend *not* going with a higher-amperage power supply. There is usually something wrong with the wiring if you’re drawing that much current, and a limited supply is protection for your system. It’s highly likely that a bigger supply delivering more current would just burn out your coils. Looking at the picture of the flipper mech that you bought, it looks to be a Fliptronic version, which by definition the hold-coil is meant to be computer controlled, and the EOS switch is normally-open (NO), *not* normally-closed (NC) as they should be for an automatic hold. So, most likely, you’re flipping with the hold-coil enabled, and then going to power-coil only at EOS, which would definitely trip your supply. Oh man. I was staring at it right in the face I didn’t even see it. Well without a doubt your 100% right. That is whats causing my dilemma. Wow thank you thank you. That complicates things. Have you ever used the fliptronic setup before? So good news it works i changed the way the switch is setup instead of a normally open switch i made a normally closed switch temporary. Sure enough it works now. Yea i feel stupid because it does make sense just hard to grasp for me some reason. I’m still curious if you made a similar device as the fliptronics board? Or have used it. There are people using Fliptronic-style setups with their custom games, usually with the higher-end custom hardware from P-ROC and FAST Pinball. Also, if you are going to go the route of use a computer for control (as opposed to an Arduino), then you can make use of the “Mission Pinball Framework”, which is basically a software game controller that uses Python scripting. I prefer the non-Fliptronic, as it is fail-safe, which is usually an issue for us as custom builders as we develop our machines. But, on the other hand, I have not noticed too much latency when controlling the flippers via computer, so controlling the hold-coil shouldn’t be that much different.